Thousands of people are attending rival demonstrations - one in Barcelona and the other Madrid - amid tensions over Catalonia's independence referendum. 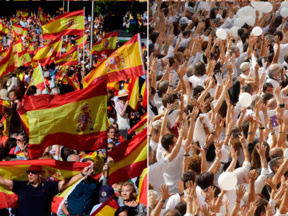 People in the capital Madrid waved red and yellow Spanish flags in support of unity, while those in Barcelona, the Catalan regional capital, dressed in white to symbolise their desire for talks and a peaceful resolution to the crisis. Some people in Madrid also wore white in support of dialogue. Separatists claimed an overwhelming victory in last Sunday's referendum, plunging the country into a political crisis. The vote was declared illegal, invalid and unconstitutional by Madrid. Ahead of Saturday's protests, a leading Catalan politician called for a "ceasefire" with Spain to lower tensions created by the region's push for independence. Santi Vila, the regional government's business minister, told Cadena SER Radio it may be the "last chance" for "a new opportunity for dialogue" with Spanish authorities. "We have to give it one more chance, maybe the last chance, and perhaps the only way that can happen is to start with a ceasefire," Mr Vila said. "We can all calm down and give ourselves the opportunity to not take any decisions and see what channels we can open up to start a serene dialogue."